Foam Shield™ products offer the safest, easiest and most cost effective way for the removal of vinyl floor tiles and asbestos mastic. Foam Shield’s™ green technology has minimal environmental impact and is 100% biodegradable. Our product can be used to remove floor tiles and asbestos mastic without the need to encapsulate the work area and dry floor grind the mastic. As the floor is not dry grinded, this proactive method eliminates fibre release within the enclosed work area. 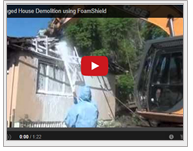 FoamShield™ is an innovative product line that saves money, lives and the environment. It is a revolutionary way to remove asbestos and capture particles while saving you time, money and resources. 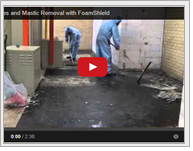 Our products create a safer working environment than traditional methods of asbestos removal. FoamShield™ is a line of non-toxic, green products that use water, surfactants and air to create a foam blanket that isolates hazardous particles during removal from structures. The product acts as a wetting agent and fibre containment system. FoamShield™ is the only removal method that actually inhibits airborne particulate release at the point of disturbance. It is truly a proactive procedure that can replace, in most instances, containment systems that attempt to control airborne fibres after they are generated. Developed for the asbestos and demolition industry, FoamShield’s™ biodegradable chemicals are safe for humans and the environment. The foam containment system was developed in recognition of the need to provide a safer workplace for employees in the asbestos removal and demolition industries. The FoamShield™ method meets all legislated requirements for asbestos removal in both Australia and New Zealand. Over the past three years, our patented method has been trialled and proven to be an effective and safe method for asbestos removal. FoamShield™ uses the latest technology available in the market for particle capture ensuring the safest possible environment for your asbestos removal project. Our products use green technology that is biodegradable in addition to offering a safer alternative to current work practices. Cost and time savings can be achieved using our innovative product line for various applications. 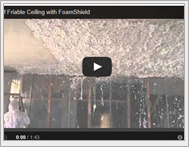 See a list of advantages of the FoamShield™ system by clicking here. The Directors of FoamShield™ in Australia and New Zealand have been in the construction industry for 30 plus years each and have an excellent knowledge of the asbestos and demolition industries. They are available to assist you in utilising FoamShield™ for your individual project needs.